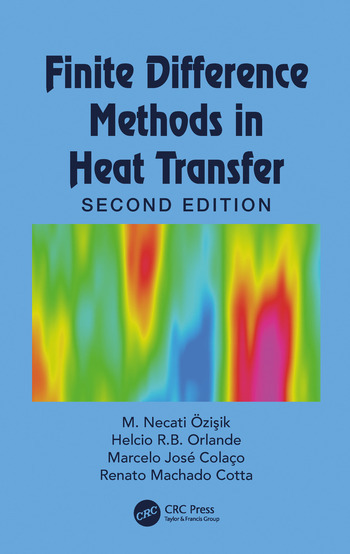 Finite Difference Methods in Heat Transfer, Second Edition focuses on finite difference methods and their application to the solution of heat transfer problems. Such methods are based on the discretization of governing equations, initial and boundary conditions, which then replace a continuous partial differential problem by a system of algebraic equations. Finite difference methods are a versatile tool for scientists and for engineers. This updated book serves university students taking graduate-level coursework in heat transfer, as well as being an important reference for researchers and engineering. Helcio Rangel Barreto Orlande was born in Rio de Janeiro on March 9, 1965. He obtained his B.S. in Mechanical Engineering from the Federal University of Rio de Janeiro (UFRJ) in 1987 and his M.S. in Mechanical Engineering from the same University in 1989. After obtaining his Ph.D. in Mechanical Engineering in 1993 from North Carolina State University, he joined the Department of Mechanical Engineering of UFRJ, where he was the department head during 2006 and 2007. His research areas of interest include the solution of inverse heat and mass transfer problems, as well as the use of numerical, analytical and hybrid numerical-analytical methods of solution of direct heat and mass transfer problems. He is the co-author of 4 books and more than 280 papers in major journals and conferences. He is a member of the Scientific Council of the International Centre for Heat and Mass Transfer and a Delegate in the Assembly for International Heat Transfer Conferences. He serves as an Associate Editor for the journals Heat Transfer Engineering, Inverse Problems in Science and Engineering and High Temperatures – High Pressures. Marcelo J. Colac¸o is an Associate Professor in the Department of Mechanical Engineering at the Federal University of Rio de Janeiro - UFRJ, Brazil. He received his Ph.D. from UFRJ in 2001. He then spent 15 months as a postdoctoral fellow at the University of Texas at Arlington working on optimization algorithms, inverse problems in heat transfer, and electro-magneto-hydrodynamics including solidification. Afterwards, he spent one year performing research at UFRJ/COPPE on a prestigious CNPq grant as an Instructor and a researcher. From there, he joined Brazilian Military Institute of Engineering where he was teaching and performing research for five years in numerical algorithms for analysis of MHD flows, EHD flows, solidification problems, optimization algorithms utilizing response surfaces, and fuel research. For the past years, he has been teaching and performing research in Brazil and helping to build a large and unique fuels and lubricants research center at the UFRJ. He is the co-author of some book-chapters, and more than 200 papers in major journals and conferences. He was the recipient of the Young Scientist Award, given by state of Rio de Janeiro, in 2007 and 2009 and the Scientist Award in 2013 and 2015. Prof. Colac¸o is also member of the Scientific Council of the International Centre for Heat and Mass Transfer.